An ingrown toenail, or onychocryptosis, can happen to anyone. Often the problem is hereditary, but can be the result of improper footwear or improper nail care. Ingrown toenails can even result from harming your toe by dropping something on it or stubbing it on something hard. Most importantly, if you suspect an infection in your toenail, or if you have a medical condition that can potentially affect your feet (such as diabetes), have the toe inspected by a professional as soon as possible. 1. Soak your foot in room-temperature water and tenderly massage the inflamed area of your toe. 2. Use anti-bacterial ointment to prevent infection while the toe heals. 1. Cut a notch in the nail or cut the nail in an abnormal way. This will not force the nail to grow as it should. 2. Do not rely on over-the-counter medications. These may temporarily relieve pain, but will not cure the underlying cause. 3. Do not pick at your nail. Doing so will create an infection. 1. Wear correctly fitting shoes. Not too loose, not too tight. Well-fitting shoes will lessen pain on the toes when walking quickly. 2. Keep your nails trimmed in a straight line. Do not cut them too short. 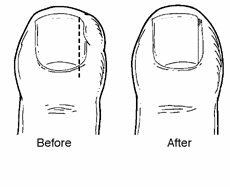 A good length is if you can still get your fingernail under the sides and end of the nail but not long enough to rip holes in your socks. If you’re currently suffering from an ingrown toenail that you can’t seem to shake, professional treatment might be the only way to cure the issue. Our doctors have treated countless cases and would be more than happy to help you through the process.